The CIPP End Seal insures a watertight seal at the ends of CIPP sections using the same reliable sealing technology that has made NPC the world’s leading supplier of pipe-to-manhole connectors. 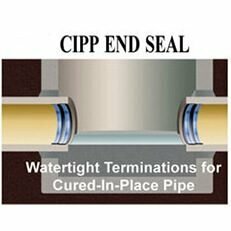 The CIPP End Seal utilizes the NPC patented slotted expansion band to provide maximum sealing force with a minimum reduction in pipe diameter. This unique design captures the rubber and compresses it against the existing pipe and new CIPP liner creating a permanent mechanical watertight seal. The patented NPC Slotted Band is constructed from a single piece of 300 series Stainless Steel precisely rolled to match the diameter of the CIPP liner. The band is then expanded using a hydraulic expansion tool. As the band expands the integral latching mechanism progresses from slot to slot, positively locking on each one until the next one is reached. There is an audible click created by the spring/rubber interaction as the band is expanded into place. The unique shape of the slotted band provides the maximum amount of strength and sealing force with the least possible thickness. Eliminates Infiltration / Exfiltration between the CIPP liner and existing pipe. Reduces Risk of Liner Deterioration caused by groundwater. Meets ASTM C923 Watertightness Specification. Ready to Order With Primeline? At Primeline Products Inc., our friendly staff is ready to assist contractors and plumbers with all of their questions and concerns.